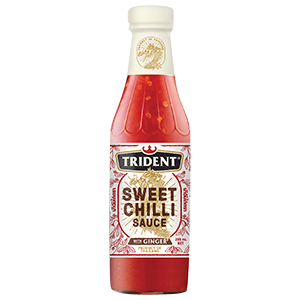 You can’t beat the deliciously authentic taste of Trident’s Sweet Chilli Sauce. Made from a traditional Thai recipe, and great with any meat, chicken, or seafood. Ideal for use in a variety of culinary dishes, as a dipping sauce or at a BBQ. No wonder it’s New Zealand’s favourite! Trident Sweet Chilli Sauce Hot is based on the same traditional Thai recipe as the Original, but we've taken the heat factor up a notch or two for those who like a bit more kick! Trident Sriracha Chilli Sauce - sweet, spicy and tangy. Sriracha is a complex hot sauce we've brought straight out of Thailand and into Kiwi pantries!